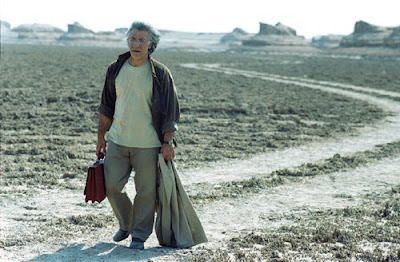 Kheili Dour, Kheili Nazdik (So Close, So Far, also known as Too Close, Too Far Away, 2005) is an award-winning Iranian film directed by R eza Mirkarimi, who also produced and co-authored the work. It tells the story of a prominent neurosurgeon, played by Masoud Rayegany, whose life is suddenly jolted when he learns that his son is terminally ill. The film begins a few days before the Iranian New Year’s (“Nowruz”) celebration with a depiction of various activities and involvements of Dr. Mahmoud Alem, an upper-class neurosurgeon in Tehran who is high enough up in his profession to be interviewed on television talk shows. In these episodes the viewer gradually gets a picture of Dr. Alem’s life through the process of slow disclosure. He drives a Mercedes-Benz, lodges thousand-dollar wagers over the Internet on horse races, and engages in dodgy, ethically-questionable schemes to charge exorbitant fees. In fact he is so absorbed in his own activities that he doesn’t have time to attend a party for his eighteen-year-old son, Saman. We also learn that he and wife are separated and that she lives in some other, apparently Western, country. The Iranian Nowrouz is the major holiday of the year, and most Iranians go off on vacation during that time. Since his son is an enthusiastic amateur astronomer, Dr. Alem is planning to give Saman an expensive telescope. But Saman wants to use the holiday period to go off into the Iranian desert with a group of fellow astronomy enthusiasts in order to better observe the stars, and he departs on the trip before his father, preoccupied with his own activities, can give him the telescope. Just at this time, though, Dr. Alem is sent a clinical magnetic resonance imaging report about his son’s health, which indicates that his son is terminally ill with brain cancer. Though Saman is only experiencing occasional headaches and nausea now, it is evident to the doctor that his son has only weeks to live. As the crushing news weighs in on him, the doctor realizes that he has essentially neglected his son over the years. Though they have been living in the same house, they have for some time been far away from each other. At this point, the day before Nowrouz, the doctor, wanting to be at his son’s side, sets off in his car and heads to the desert village of Mesr. Quickly, from the urban hustle and bustle of Iran – crowded with traffic jams, cell phones, digital cameras, and the Internet – the action now shifts to the road and the pace of life in the desolate and sparsely-populated desert. The journey is, of course, metaphorical, as the doctor seeks not only to find his son, but to find an authentic and meaningful connection with his son -- and perhaps to find himself, too. The doctor meets a number of people along the way, but the key encounter is with the young woman doctor who attends to the village of Mesr. This woman, played by the soulfully beautiful Elham Hamidi, immediately recognizes and virtually idolizes the famous Dr. Alem, and then proceeds to describe the circumstances of life in the town. She informs him that his son has already left for a further remote location in the desert, which is an old mine that is almost a day’s drive away, and she convinces him to spend the night in the town and set out for the mine location the next morning. In the meantime Dr. Alem, steeped in Western science and technology, pensively observes the tradition-bound ways and beliefs of the country people. They seem to be happy, but the scope of their lives seems so limited, and he mentally scoffs at their superstitions and their blind faith in God’s will. The only thing that can save people, according to his compass, is science and skill, not fate or luck. But even that has its limits, and he realizes that he, himself, with all his technical training, can do nothing to save his own son. Curiously, the film implies that cell phone towers seem to be set up in the remote regions of the eastern-central Iranian desert, because Dr. Alem manages to contact his son and girlfriend by using his mobile phone. Learning that his son has had a further seizure, he urgently sets out alone in his Mercedes early in the morning. But the Iranian desert is treacherous and subject to sudden, overwhelming sandstorms. The doctor eventually runs out of gas and is then trapped in his car as a sandstorm sweeps across the plain. Very early in the film, Alm had once coolly explained to a distressed mother that her terminally comatose son was better off dead and should be taken off life-support. He explained to her that it was like being trapped at the bottom of an abandoned well in the middle of the desert, with noone there to help you or communicate with you. Now Alem finds himself in the same intractable situation. It is a wishful dream, a hallucination. It is a final moment before his death when he realizes the lost opportunity of being a nurturing father to his son. His son and companions have found and saved him. He is restored to life in this physical world. He is joining his son, but in the next world, not in this world. The extended hand is the agency of the God that Alem doesn’t believe in. According to all three interpretations, Alem has surrendered, but this surrender, to me, does not appear to coincide with enlightenment and spiritual fulfilment. The title of the film, "Kheili Dour, Kheili Nazdik”, means “very far, very close” in English, but it also suggests the phrase, “so near and yet so far”. This theme is reflected in numerous circumstances in the film. Saman refers to it explicitly when describing over the phone to the woman doctor in Mesr the relative distances of various stars from Earth. But there are other symbolic references, as well. Alem is physically close to a number of people, including his son and the people of eastern Iran, and yet he is far away from them in spirit. The closing shot further evokes this theme. The themes and issues of Kheili Dour, Kheili Nazdik suggest affinities with Majid Majidi’s work – particularly, Father (Pedar, 1996), The Color of Paradise (Rang-e Khoda, 1999), and The Willow Tree (Beed-e Majnoon, 2005) – as well as with Kieslowski’s Dekalog 1: ‘I am the Lord, thou shalt have no other gods before Me’ (1989). But I do not feel that Kheili Dour, Kheili Nazdik has matched the high standards of those works. Although it won the first prize at the 2005 Fajr Film Festival (the national Iranian film awards), it doesn’t quite resonate across the spiritual dimensions as those other films do. The cinematography also took top honors at that festival, but it, too, has some limitations. While many of the shots, especially in the desert, are stunning and atmospheric, one gets the feeling that some of the framing and compositions were done merely for decorative purposes, rather than for narrative continuity. And the number and length of straight-on camera shots of Dr. Alem facing the camera seem more to interrupt the flow, rather than to evoke effectively the mental and emotional state of the character. Nevertheless, there are many interesting images and moments in this film, which is a worthy continuation of the Iranian focus on “what it is all about”. I know UCLA has shown this film once, so they must have it with English subtitle. You can contact them and see if you can buy a copy or something. good luck.